- Digital sub-carrier NTSC, for good old NTSC video. - MUSE, for the analog HD video (that blew my mind). What I am interested on, is the digital sound/data contents, which from the info I gathered are pretty much the same with some few differences. And then I found out about Hi-Vision Laserdiscs, and apparently they use the exact same MUSE found in old satellite transmissions at the time, and then I found out that MUSE decoders can also be BS Tuners. And I have a lot to ask about that. - Does Hi-Vision Laserdiscs uses the same MUSE as the old satellite transmissions? - What kind of cable does it use, was it a standard? It looks like a composite cable but isn't. - Satellaview has a PCM decoder, which suggests to me that the bitstream output also contains the audio. Is it a normal thing? - What rate does the bitstream come out? Satellaview says "Data Rate" is 668kbps but then I see much higher speeds. Is it just the data and not the sound? First of all, MUSE is %100 digital. Only the delivery is analog. DANCE audio on MUSE is also %100 digital. There are two known encoding schemes, MUSE and MUSE II. MUSE II is backwards compatible. MUSE decoder can decode MUSE II. There are no known consumer level MUSE II decoders. It is possible later its life the satellite transmissions were switched to MUSE II scheme. MUSE II improves motion resolution with lesser artifacts. Late Hi-Vision Laserdiscs such as Legends of the Fall and the River runs through it are known to be encoded with MUSE II. MUSE II improvements are evident even on MUSE decoders. These late titles looks amazing. As I have mentioned above, the delivery is analog. Therefor a typical composite cable is used transmit the MUSE signal to the decoder. Dance audio track is in two flavors, A-Mode and B-Mode. A-Mode has left, center, right and mono surround (3+1) arrangement where as the B-mode is the typical left and right (2ch) arrangement. They are both at a little over 1.3mbps bitrate(1350kbps). A-Mode is sampled at 13bit 32Khz and the B-mode is 16bit 48Khz. In summary, the A-mode gets you 2 additional discrete channels but loses 2bits (less dynamic range) and only 32kHz sampling (20-16,000Hz freq. range). The B-mode is very close to PCM audio with its 16bit depth and 48kHz (20-24,000Hz) freq. range. Bitsream outputs on the MUSE decoders output DANCE audio track in its native form. There are no known AV processors that can decode this format. There are no outboard DANCE decoders either. Most if not all MUSE decoders convert DANCE into 2 pairs of PCM audio. A-MODE tracks are oversampled to 16bit(from 13bit) since PCM doesn't support 13bit. The sampling is untouched at 32Khz. The output is over 2 digital coax/optical. There are no known AV processors which can use two digital coax/optical simultaniously therefor this form is useless as well. B-MODE tracks are at 16bit 48kHz. The output is a single digital coax/optical. All MUSE decoders also include 4ch analog audio outputs. I looked into the Sony MSC-4000 service manual. The Dance audio is converted to PCM and then converted analog via some mediocre single bit DACs. You can feed this 4ch output into 7.1ch ext. input on your modern AV receiver. You can use a y-splitter to split the mono rears. (Sony MSC-4000 has the mono reas split internally(still mono) for 5ch output). No subwoofer output therefor you need full band front speakers or some sort of bass management in your AV receiver. If you are into retro AV gear, the below AV gear has 4ch analog input for DANCE audio. Keep in mind that these have very simple analog circuitry for the Dance input (Labeled Hi-Vision on the units). They don't do any digital processing like speaker size, distance, level. In my opinion, they are more likely to degrade the audio quality. My work around is using a pro DTS encoder (DTS CAE4). I feed the two digital coaxial outputs from the Sony MSC-4000 MUSE decoder into CAE-4 and have it output as DTS 5.1. The .1 subwoofer track is blank as it doesn't exist in DANCE and the rears are mono. Since the signal is input into my AV processor digitally, it does all of the speaker size (bass management), distance, level, room correction functions. CAE-4 outputs DTS in 1.5mbps btw. Not every of my questions were answered but I still am happy for the answer. I'm not interested on the whole AV processing, only what comes out of this Bitstream output plug. Bitsream outputs on the MUSE decoders output DANCE audio track in its native form. There are no known AV processors that can decode this format. So, the DANCE audio tracks and the generic data it could contain, like what I've seen before on a few PDFs. Only that, nothing else? The only reason why I want to know about this is just to know how the Satellaview works (which is a Japan only SNES addon that can process data from a satellite and also play audio). I thought I covered it all but let me know what I missed. As far as I know its only the DANCE audio outputted through the digital coax. I don't know of any device that can decode it. MUSE transmission through satellite has been stopped years ago. How are you planning to use your Satellaview? I am not familiar with it actually. You could use a Hi-Vision LD setup for pre-recorded media but discs alone will run you a couple of hundred $$$ each and the players are usually around $2000. Basically I just wanna send data to it to the BS IN port, doesn't mean that I have to use a Hi-Vision Laserdisc for it. At the time, you had to plug a cable from the Bitstream output port of the BS Tuner to the Satellaview, it's supposed to have the RAW DANCE data output, from what I understand from your post (and that I also guessed, but I wanted to be sure of it). I want to know what cable does the bitstream output port uses, it's a black cable that looks like composite cable, but I don't know if it's a standard or not. I also want to know the data rate because I keep getting conflicting information. As for Muse vs Muse II I'd only seen internet references to 'A River Runs Through it' as using the updated version of Muse, yet 'Legends of the Fall' is on par if not second best of the film titles I've seen, so you've helped to put that in context for me. With the DTS-CAE4, how did you overcome the problem raised here: http://forum.lddb.com/viewtopic.php?f=25&t=3925&start=60, frankly your last post there goes a bit beyond my understanding/over my head. I've used the SP-D07 to overcome this issue so far. Have to say that the upgrade to the HM-D101 resulted in a much better A-mode audio experience. Noticeably better 3-D soundfield, B-Mode seems pretty much the same. Generally I'm finding A-mode movies really noticeably sound better than B-mode (Dolby/Pro-logic). It was not such a difference before. You are welcome! I added the extra bit of information beyond the scope of the question for those who might need a little more knowledge on MUSE. OP has a different project in mind. It seems its beyond my knowledge and familiarity with the satellaview. Maybe someone else can help. If you elaborate more on your project, maybe I can give it another try. As far as I know any 75 ohm composite cable should work for the DANCE output. Defunct satellite transmissions and Hi-vision LDs were only sources for MUSE media. I am still not sure how else you obtain DANCE input to your device. Implementing CAE4 is tricky. It only takes balanced AES and 48kHz sampling. Inputs are 3 pairs of balanced XLR AES. Going from Spdif to AES is easy or modifying the CAE4 to take spdif is easier. 32kHz DANCE audio needs to be oversampled to 48kHz and put into L/R, C/SW, SR/SL format. SW would be muted and SR/SL would carry the same mono information. This is beyond soldering in a few components. You need to design an entire board for this. Right now all my stuff and projects are on hold until my housing situation is settled. I will continue and complete the Hi-vision to BD and DANCE audio to modern AV gear integration projects. It will take some time, like a year. As for the 07D, its a very simple machine. L/R and C are routed to the output untouched (it skips the digital processing). Mono rear is split to two and -3db attenuated otherwise untouched as the fronts. Front L/R inputs are also routed to an analog passive low pass filter for the subwoofer output. Of course each input goes through an analog volume control circuitry(analog is better in this case). The reason for the improved sound could be explained by better DACs in the Pioneer decoder. Most if not all AV processors route their 7.1 ext input to speakers untouched. So I am pretty sure you rely on the Pioneer decoders DACs. On the 2ch input, once you engage Dolby Prologic or any DSP sound field, the signal is digitized for this process then using the AV processors own DACs converted back to analog. This analog to digital then back to analog process might be degrading your B-mode experience. I witnessed terrestrial analogue HD transmissions at my girlfriend's parent's house on the Kanto plain in the late '90s. Compare it to the "HD" broadcasts we get now MORE THAN 15 YEARS LATER in Australia and it's a big joke. The powers that be have decided to use the bandwidth for 17 infomercial channels instead of one or two true HD channels. Even when they're forced by the licensers to show actual HD for like the US Masters golf for example it's good but not as great analogue HD was. Basically, we may use an Arduino or something to input the data. I want to input something like the old signal from back then, we have figured out what kind of data the Satellaview outputs to the software that uses it. What I want to know was to make sure what kind of data comes out of the bitstream output port, at which rate, just so we could try to input the RAW DANCE data into the Satellaview. And then the plug is weird because the barrel size seems different. 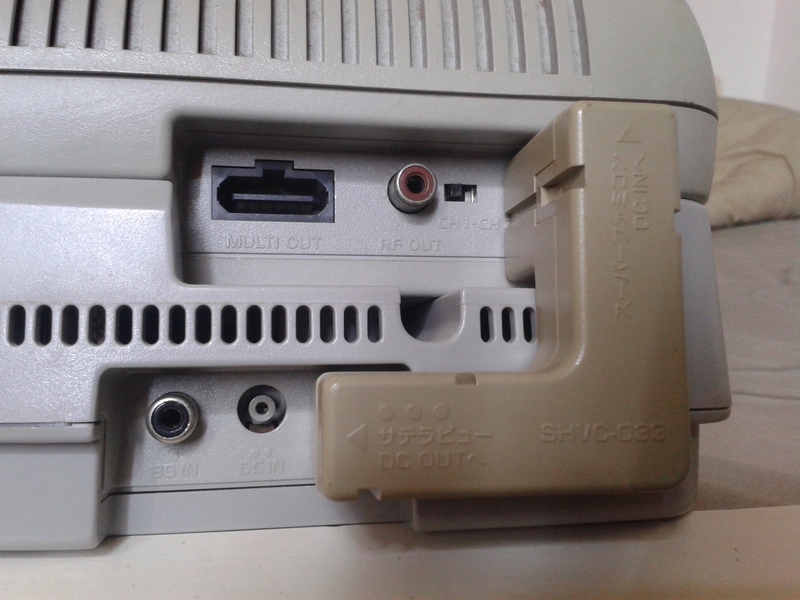 I tried to plug a video RCA plug to the Satellaview just to try and it feels like it's not the right cable. What I've learned is that DANCE data has audio and generic data, Satellaview decodes the audio with the PCM decoder, and the Data Channel Decoder chip processes the logical channels (according to japanese patents) to then let the software to get the data from it. OK, I wish I'd seen this sooner, because there's quite a bit of confusion going on here. The really important thing to recognize is that the Satellaview is not intended to work with Hi-Vision broadcasts using DANCE audio. It might actually work, but it's not intended to. Satellaview data was transmitted (occasionally!) on the digital audio subcarrier of NTSC broadcasts. The formatting of that bitstream is where you should be looking. I mostly asked even if it's not using MUSE because I expected things to be similar to what it was back then, at least on the audio/data aspect of it. I did find what I wanted to know, and that NTSC and MUSE data is not actually the same, it's similar but it's not the same, but however I want to make sure of something: how is the data output going, electrically speaking from the bitstream output plug? I've looked at S/PDIF and found out about Biphase mark code. I mostly want to make sure of the Vpp and other things like that, which I expect to be same between NTSC and MUSE. Bumping, as I still want info on how the bitstream output is electrically sent, Vpp, encoding, etc... I expect it to be the same between NTSC and MUSE. That I can tell you. If the documentation I have is correct (I should hang a logic analyzer or something on it to make sure), it is a pure serial data stream (I assume high=1 low=0, although it could be inverted) at 0.5 V peak-to-peak. You'd need to put it through some kind of buffer amplifier (I'd probably use an op-amp set up for very high gain) to bring it up to TTL logic level. Considering the bitstream cable is actually RCA, a serial stream has data bit and clock at least... IIRC there's only one signal that can go through one. 1350 kbps so far as the MUSE bitstream is concerned, self-clocked. There are "header" sequences every so often which supply the necessary synchronizing information. It's vaguely analogous to the way an analog video signal contains sync pulses. I'm wondering, can I see the documentation you were talking about? Sorry to bump this with what is pretty much a double post, but I'm still interested to know how it electrically works (as in like, I'd love to see oscilloscope pictures to make sure), and have documentations on the Bitstream output port. EDIT: According to the manual of the Satellaview, a MUSE-NTSC converter is supposed to work. That's interesting.